Tues. #1 is HERE. Please follow us on Tumblr or Twitter, subscribe on YouTube or like us on Facebook! Don't miss Nickolye's SmackDown Live Recap at 8 PM ET, Nerdcast w/ The Ugly Ducklings at 9 and Nick's 205 Live Recap at 10! With the cheap plugs out of the way here's Tuesday's latest news. On his latest podcast Eric Bischoff praises the Samoa Joe and Brock Lesnar rivalry: "I love that match-up. 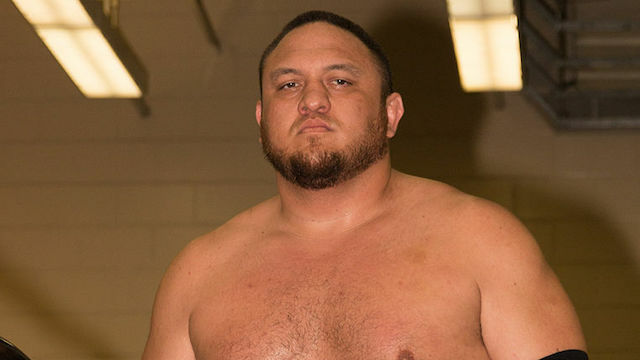 I can't say enough about Samoa Joe and I think just chemistry-wise and intensity-wise, that's a very natural match-up. So was Bill Goldberg, by the way, but Bill Goldberg and Brock Lesnar had history attached to it. They did a great job with that history. They had a great angle in WWE but Joe is fresh. This has never happened before and Joe is a guy who can go toe-to-toe with Lesnar with character, intensity and the ability to make me believe it in the ring. When they are standing there eye-to-eye and chest-to-chest I believe it. I think it's great." Meanwhile here's how the Balls reacted after their segment took place. Misc. tweets and social media posts are below! In this interview Eva Marie says The Rock is a mentor: "Yes, he's awesome. I literally couldn't ask for a better mentor. He's done exactly what I'm trying to do, he gets it. Going into an audition or putting yourself on tape, it's not the easiest thing to do especially because an audition is usually a camera and one person and then you have to bring to life this character. His advice to me is do the work, always put 110% effort into whatever it is that I'm doing, especially when it comes to these auditions and bringing these characters to life. And then, be yourself when you walk into the room, never change. Leave it all in there. Once you're done, walk out and you're onto the next. That's what I've really tried to carry throughout the process of going in for auditions, and not taking anything too personal because there's so many factors that come into people getting roles, whether it's not the right look or doesn't have the right accent or wrong color hair. The list goes on, so you gotta take it lightly and move on." On the Edge & Christian Show, Mike (Bennett) Kanellis reveals who told him not to re-up with Impact: "We had talked to TNA and we were actually really close to re-signing and it was like maybe a, maybe a week before we re-signed where Kevin Owens reached out to us and he was like, 'what are you guys doing? I heard you are re-signing with TNA. I don't think you should do that. That's a stupid idea. You should come here.' And we were like, 'Well, we're going to re-sign' and he said, 'I think you should wait off a week or so.' And when we saw him the first time at TV, he was like, 'aren't you glad you listened to me?' because he actually put the brakes on us re-signing with TNA. And we waited and that's when Regal had called. We then had to reach out to TNA and just be like, 'Yeah, [for] personal reasons, we aren't going to re-sign' because if you say something to them about WWE, it's going to get out there because what do they care at that point? And you can't blame them, but we were like, 'Yeah, it's personal reasons - we're going to do other things and maybe take a break from [pro] wrestling for a little while.' Whatever you can think of at that point." The official bullet points for SmackDown Live are below! To break it down another way here's a non-spoiler match listing. Here Seth Rollins doesn't rule out the possibility of a Shield reunion: "I'm sure it could happen at some point, you never know. We're all on our own page and have one goal in mind, like we did before. We've all got our individual goals now. It would take something very special to get all three of us back together with a singular goal. That was the focus before, and the reason we came together to begin with, we had a singular goal to make waves. Now we're on our own, with our own individual goals, so who knows, never say never, but the good thing is I see all of us being around for a long time. There will always be the possibility of us coming back together and slapping on a tac vest." 1) Sami Zayn defeated Baron Corbin. Corbin comes out with the Money in the Bank briefcase. After Zayn offense Corbin dominates until Zayn gets the rollup out of nowhere for the win. Not really good booking of Corbin if he's supposed to be a monster. 2) American Alpha, Sin Cara, and Tye Dillinger defeated The Ascension, Epico, and Eric Rowan. There was a 10 train after the faces did the 10-punch deal in the corner. Gable plays Ricky Morton before hot tag to Jordan which leads to Cara dive and the Alpha Finisher on Epico. Gable gets pin even though Jordan is legal man. 3) Luke Harper defeated Aiden English. English came out with his singing intro and ran down the fans and Bakersfield in the process. English controlled match by working on Harper's left arm. Harper rallies for the win with a discus lariat. 5) Naomi defeated Lana in Smackdown live Women's title match. Lana riles up crowd into a USA chant and holds the edge for first part of match. Naomi bounces back and gets pin with a split legged moonsault. Charlotte promos her match tonight from the CSU Bakersfield (my team) locker room. 6) Usos retain tag title in a 3-way over Breezango and New Day. Kofi and Big E come with a Booty O's inflatable and the Ice Cream bike. Comedy early leads to Usos controlling match against Tyler Breeze. Breeze plays Ricky Morton before tagging in Fandango. Teams fight to floor where Kofi hits a dive. Fandango goes for dive but is kicked in head by an Uso for the win. Intermission runs from 910-925. Out of break. 7) Rusev defeats Mojo Rawley with his version of the Camel Clutch. Mojo hit all of his offense in 90 seconds only to be laid by a kick and taps out shortly thereafter. 8) Charlotte Flair defeated Natalya. A very smooth/snug back and forth match leads to Charlotte's figure 8 for the win. 9) Randy Orton and Shinsuke Nakamura defeated Jinder Mahal and Kevin Owens in the main event. These 4 were announced to to have singles matches before being switched to a tag. Good guys go up early. Distraction leads to Nakamura being double teamed. Tag to Orton. He goes on offense and hits a double DDT to Singh brothers. Nakamura with his Finisher to Singh. Orton RKO for the win. In his Two Man Power Trip interview, Jim Cornette believes Table For 3 may have made Vince Russo paranoid: "We had a great time doing Table for 3 and it got such great feedback on Twitter, people raved and everybody wanted to see more and petitioned the WWE to see more. The only person that actually didn't like it was Vince Russo. He kind of got offended (I guess) that as part of the discussion that we had and that Eric Bischoff and I who have never been friendly and it was the first time we had talked face to face in over twenty years bonded over a mutual dislike of Mr. Russo. As that came up and we mentioned that, the WWE was quick to flash that picture up there because I guess they wanted to make that point and he got offended. We exchanged some harsh words in both directions on our podcasts. I had said some harsh things that I have expressed remorse about and in fact on my YouTube channel, the statement is up there now and finally when I had said such harsh things about Vince Russo that I was served with a protective order and that he accused me of stalking him for eighteen years, I didn't realize that I had taken it that far and I had no idea of that. It ordered me to stay away from him, his family, his residence (that I've never been to) and his wife (that I haven't seen in over twenty years) and to never call his phone (that I never called and didn't have the number to until last week) but I shouldn't do that and I am not going to do that because after all it is court ordered. I really feel bad and express remorse that I scared the little fella so bad that he would have to go through something like this and it has gone too far. So we will be lighting up on the poor thing and I don't want to be accused of putting somebody in fear of their life." Here Damien Sandow reveals what goes into a MITB match: "There was a real collaboration to make the match work. That is because of the agents and the talent in the match, and I was very lucky to be in there with such pros both times I was in a Money in the Bank match. I don't want to name specific agents because I don't want to leave anyone out. Being an agent is a very thankless job, but every single agent I ever worked with was constructive and awesome. As for talent, Dolph and Cesaro are the names that come to mind as awesome." WWE is hosting a livestream with Cathy Kelley on Facebook later today. To honor the 15-year anniversary of IMPACT Wrestling, a subsidiary of Anthem Sports & Entertainment Corp., the City of Orlando has declared Wednesday, July 5, 2017, as "IMPACT WRESTLING DAY IN ORLANDO." Orlando Mayor Buddy Dyer will present a proclamation honoring IMPACT Wrestling before taping begins July 5 for a future episode of IMPACT on Pop TV. IMPACT has filmed most of its weekly, two-hour TV show over the past 15 years on the backlot at Universal Studios Florida, dubbed The Impact Zone. This is the first time Mayor Dyer has attended an IMPACT Wrestling show - and he's not just attending in a mayoral role. Mayor Dyer also will serve as the "Special Ring Announcer" for two matches. "Orlando is already known worldwide as an epicenter for entertainment, and as we have worked to diversify our economy, growing our sports-based industries has been a strong focus," said Orlando Mayor Buddy Dyer. "Blending both entertainment and sports, IMPACT Wrestling is the exact type of event we'd like to continue hosting in Orlando. We are grateful to IMPACT Wresting for its commitment to, and investment in, the City of Orlando and look forward to IMPACT's next 15 years of growth in our community." 3:00 PM ET. Kenny Omega on being a foreign star in New Japan: "That's a very loaded question, a very difficult question. As much truth as there is to that statement. You know, the old glass ceiling... Where you can only do so much in a foreign country because at the end of the day your job is to put over the hometown talent. That's true to a degree because you know, when you're wrestling for a foreign company, chances are, there's going to be an established star that speaks the native language, that lives there, that wrestles all the bookings, doesn't travel too much outside of that home promotion. Companies will naturally want to build their promotion around that person. I have sort have made it my mission to be treated less as a foreigner, less as a guest. I wanted to be part of the team, part the family. I wanted to show - not only to the company, to the people, to the fans - my home is Japan." The Top 10 moments from last night's Raw (according to WWE) are below. 4:00 PM ET. Here is tonight's official 205 Live preview: "When WWE 205 Live began, Cedric Alexander competed with then-girlfriend Alicia Fox at his side. That is, until the former Divas Champion was courted by Noam Dar, causing a rift in her relationship with Alexander as well as affecting Alexander's in-ring performance. Eventually, The Scottish Supernova won over Alicia, and Alexander was sidelined with an injury. When he finally returned to action, Alexander made it clear that he had moved on from his relationship with Fox and the drama that orbited with Dar. However, WWE 205 Live's power couple has done anything but leave Alexander alone. Even while at home nursing a neck injury, Alicia has done her best to make her ex-boyfriend's life miserable with her current beau doing her bidding. Meanwhile, Dar's efforts to focus on their relationship landed him in hot water last week when he mistakenly threw Ariya Daivari's $15,000 suitcase in the river, thinking it was Alexander's. Dar suggested that he and Alicia Fox just want Cedric Alexander to quit WWE 205 Live. Is that what it will take for Alexander to be free of the drama and Fox to focus solely on The Scottish Supernova, or does Alicia have something more nefarious planned tonight on WWE 205 Live?"